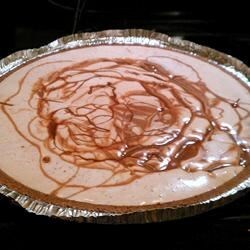 "This is a very easy pie recipe that my husband absolutely loves. It's a yummy mixture of marshmallow, chocolate bars and whipped cream." In a microwave safe bowl, combine marshmallows, chocolate bars and 1/3 cup of cream. Microwave on high, stirring occasionally, until everything is melted and smooth. In a medium bowl, whip remaining cream until it is light and fluffy. Fold into chocolate mixture. Spread entire mixture into graham cracker crust; cover and refrigerate for 2 to 3 hours. This pie was so easy to make and was a huge hit at our Progressive holiday dinner!! Wow!!!! Absolutely the best chocolate pie ever!!!! Wow, this pie was so rich and delicious - sure to delight any chocolate lover! less than 15 minutes to prepare. So simple!!! Nice and easy. I think I'd use more marshmallows next time to keep it a bit lighter. I didn't have any candy bars on hand, so used chocolate chips--bittersweet and semi-sweet.